According to John Hanson, Litin Vice President/General Manger, handling trim waste, while in itself not a major problem, was a nagging annoyance made worse by Litin�s rapid growth rate. The Fox Runner™ uses CAC's widely employed Fox TrimAway® pneumatic trim removal components mounted to a portable stand for permanent, semi permanent and temporary applications. The complete Fox Runner™ portable system includes CAC's exclusive venturi design; a regenerative, exceptionally quiet, virtually maintenance free blower; all the blower hardware, motor starter plug and cord, blower filter. Additionally, the system includes pick-up nozzle(s) and Y connectors; 10-foot standard intake and discharge ducts with high torque duct clamps; complete welded tubular steel system mounting frame and locking casters. Options include collection units such as high-capacity nylon bags and metal collection bins, and discharge ducts over 100 feet long. FOX Runner®, Converter Accessory Corporation�s (CAC) exceptionally popular portable pneumatic trim removal system is now available with CAC's new variable speed blower control. This combination allows for the ultimate in energy efficient pneumatic trim removal. According to Jeff Damour, Engineering manager, �The portability of FOX Runner allows it to be used where ever it will have the most impact in your plant. Now, combined with CAC's new variable speed blower control, FOX Runner offers the ultimate in energy savings and convenience for pneumatic trim removal�. The FOX Runner is stable enough to put in place for long term trim handling or it can be easily transported to new locations and rapidly set up and put to work. In many cases FOX Runner�s portability can save converters the need to purchase multiple trim removal systems. FOX Runner uses CAC's long time successful FOX TrimAway® pneumatic trim removal components mounted to a portable stand for permanent, semi-permanent and temporary applications. It is offered as a complete, turnkey system that can be readily and quickly integrated in any trim removal application. FOX Runner portable systems include CAC's exclusive venturi design, a regenerative blower, blower hardware and filter, motor starter with plug and cord. Additionally, the system includes pick-up nozzles, Y connectors, duct work and high torque duct clamps. All FOX components are mounted to a tubular steel frame with locking caters. Optional components available are collection bags and bins, silencers and additional duct for long conveying distances. The soft starting feature built in to these VSD�s will start the blower motor with a smooth, linear acceleration of a programmed time. The advantage when compared to standard blower starters is there is no sudden inrush of current that puts large demand on power lines. Soft starting eliminates stress on electrical and mechanical components. Maintenance costs are reduced and lifetime of system blowers extended. High starting currents and voltage dips in the supply network, which might cause process disturbances, are eliminated. The unique design and performance of Converter Accessory Corporation�s (CAC®) FOX TrimAway®, and FOX Runner® trim removal systems can improve efficiency and reduce energy consumption in web converters� waste management operations. CAC's employment of frugal energy consuming regenerative blowers in the FOX system allows for a major reduction of energy consumption when compared to systems that use energy gobbling compressors. Since these systems are available in four venturi sizes, with blowers of one to 15 horsepower, CAC is able to customize an entire system to precisely match a converter�s requirements by operating continuously at the maximum speed of the web it serves need without resorting to energy wasteful over-sizing. Jeff Damour, CAC engineering manager, says CAC's business philosophy has always been based on making web operations more efficient and thus more sustainable while increasing profits. Made in the USA, FOX TrimAway® and the FOX Runner® are engineered for efficient trim removal during production or converting of most web materials including, paper, film, foil, board, nonwovens and textiles. They are effective with trim ranging from 1/16“ to 6“ widths and can operate at speeds up to 4000 feet per minute. FOX systems can be supplied with a CAC chopper and can operate as a single installation or as a coherent system consisting of several FOX TrimAway® systems. A complete CAC FOX TrimAway® system includes all required parts and components needed to begin efficient trim removal. In most cases installation takes less than an hour. All CAC FOX systems are modular constructions sized to customer requirements. All components are engineered to match each customer�s specifications. Converter Accessory Corporation (CAC®) is introducing the FOX Runner® a new, portable option for trim removal. The FOX Runner® uses CAC's® widely employed FOX TrimAway® pneumatic trim removal components mounted to a portable stand for permanent, semi permanent and temporary applications. The complete FOX Runner® portable system includes CAC's® exclusive venturi design; a regenerative, exceptionally quiet, virtually maintenance free blower; all the blower hardware, motor starter plug and cord, blower filter. Additionally, the system includes pick-up nozzle(s) and Y connectors; 10-foot standard intake and discharge ducts with high torque duct clamps; complete welded tubular steel system mounting frame and locking casters. Options include collection units such as high-capacity nylon bags and metal collection bins, and discharge ducts over 100 feet long. What distinguishes the FOX Runner®, according to Jeff Damour, CAC® Engineering Manager, are high-speed production, versatility, energy efficiency, low maintenance and easy installation. All FOX TrimAway® systems are designed to be exceptionally easy to install and easy to operate. They are quiet, frugal consumers of electricity, especially when compared to systems that rely on energy gobbling compressed air. All FOX TrimAway® systems feature modular constructions sized to customer production requirements. CAC® offers Fox technology in over 30 standard systems. The portable FOX Runner® FX1.5 can handle up to 2 inch wide trim at speeds to 2000 feet per minute, while the larger FX2 can run at speeds to 6000 fpm. In installations where 2000 fmp is an optimal speed, the FX1.5�s small size contributes to its unobtrusive installation in locations that would not accommodate a larger system and also offers more energy efficiency. The FOX Runner® uses CAC's® widely employed FOX TrimAway® pneumatic trim removal components mounted to a portable stand for permanent, semi permanent and temporary applications. FOX Runner® , Converter Accessory Corporation�s (CAC®) recently introduced, portable system for trim removal, is proving to be extraordinarily successful. In a multi web plant, the portability of the FOX Runner allows it to be used wherever it will have the most impact. The FOX Runner is stable enough to put in place for long term trim handling or, if a line is down for repairs or maintenance, for example, it can be easily wheeled to new locations throughout a plant and rapidly set up and put to work wherever it is needed. In many cases the FOX Runner�s portability can save converters from the need to purchase multiple systems. The FOX Runner uses CAC's long time successful FOX TrimAway® pneumatic trim removal components mounted to a portable stand for permanent, semi permanent and temporary applications. It is offered as a complete, turnkey system that can be readily and quickly integrated with a running web. The complete FOX Runner portable system includes CAC's exclusive venturi design; a regenerative, exceptionally quiet, virtually maintenance free blower; all the blower hardware, motor starter plug and cord, blower filter. Additionally, the system includes pick-up nozzle(s) and Y connectors; 10-foot standard intake and discharge ducts with high torque duct clamps; complete welded tubular steel system mounting frame and locking casters. Options include collection units such as high-capacity nylon bags and metal collection bins, and discharge ducts over 100 feet long. Compressed air is designed to operate equipment which requires very high pressure, very low volume. As a rule of thumb, it is never advisable to exhaust compressed air into atmosphere, which is exactly what you�re doing when you use this type of venturi trim/scrap removal. Why? Because compressed air volume is very expensive in energy consumption and maintenance when compared to blower air volume. Also, other areas of your plant operation may be negatively effected downstream of a venturi compressed air system that strains the compressor, dumping valuable compressed air into the atmosphere. Converter Accessory Corporation�s (CAC®) new Trim-AX™ chopper for chopping nearly every type of web waste trim materials is a two bladed unit capable of 3,450 cuts per minute with a 1,725 rpm motor. It features variable speed control. Thanks to extra heavy duty construction, with a dual bearing support, the system is exceptionally stable and runs quietly. Rotating blades are easily changed and are readily available from CAC®. Now offered as a separate component, Trim-AX™ was originally designed to work smoothly with CAC's family of Fox TrimAWAY™ trim removal systems. 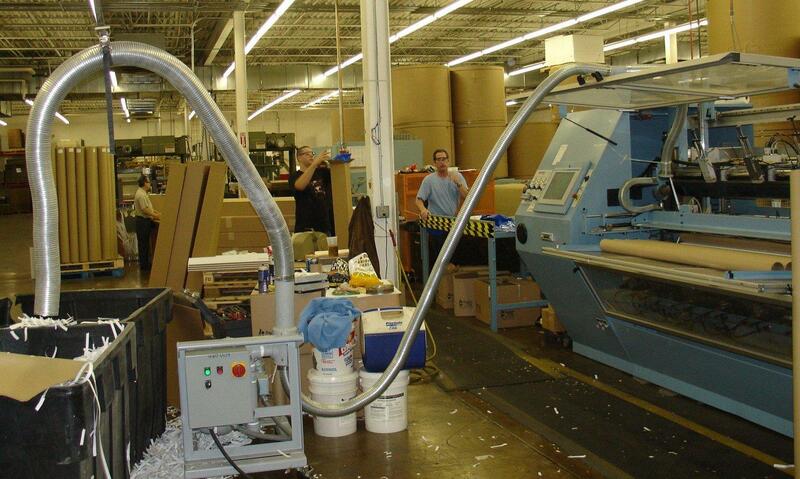 The Trim-AX™ can easily be integrated to enhance operation of most venturi air conveying waste removal systems. According to Jeff Damour, CAC® Engineering Manager, CAC's Fox systems do not need a chopper to be effective. However, the Trim-AX™ can allow an air conveyor system to work over longer distances, over 200 feet with a Fox system, for example. The Trim-AX™ also makes waste handling more efficient and chopped trim takes less space in collection bins. ”Customers told us they were not satisfied with the choppers that were available. They asked us to find the best option and after examining the possibilities, we decided to design and build our own. Converters who are looking to blow trim longer distances, have limited storage space, or who want size reduced trim for reprocessing efficiency should give careful consideration to the Trim-AX™. It�s an exceptionally well designed unit and is built to last,“ Damour said. The Trim-AX™ is an optional component of CAC's large offering of Fox trim removal systems. CAC offers 30 standard systems with blowers from 1-horsepower to 15-horsepower. All components are engineered to match each customer�s specifications. In addition to the Trim-AX™ components include a unique, adjustable Venturi, Gast® Regenerative Blower, pickup nozzle, Y connectors, collection centers, flexible ducts, motor starters, filters and silencers if needed. CAC® is introducing the Fox Combo™, a new, factory assembled, combination trim removal and chopper system that ships as a single complete unit. The Fox Combo™ combines the widely employed, venturi-based Fox TrimAWAY® with CAC's recently introduced TrimAX™, a two bladed chopper capable of 3,450 cuts per minute. The two systems are both mounted on a sturdy, but moveable framework and are designed to be used together or independently. CAC® offers 30 standard Fox systems with blowers from 1-horsepower to 15-horsepower. All components are engineered to match each customer�s specifications. Components include a unique, adjustable Venturi, Gast® Regenerative Blower, pickup nozzle, Y connectors, collection centers, flexible ducts, motor starters, trim choppers, filters and silencers if needed. Converter Accessory Corporation (CAC®) is introducing a new addition to the Fox Runner® portable trim removal system. The FOX Runner Matrix® system is engineered specifically for tag, label and other narrow web press matrix removal in web widths to 22 inches at speeds to 700 feet per minute. Waste matrix material can be transported over 100 feet, with overall performance dependent on the amount of die cut or open area in the matrix. The system can be easily integrated into existing lines and disconnected, moved and reconnected in about 15 minutes. A major benefit of the new FOX Runner Matrix system is elimination of the need for rewinding matrixes and production interruption for roll changes. The elimination of matrix rewinds also helps reduce web tension fluctuations caused by increasing matrix waste roll diameters. Frequently, tension increases derived from large matrix rewind rolls cause matrix breaks, especially with thinner gauge, narrower width materials, and require time-consuming re-threads. Since it does not rely on the matrix web strength for smooth rewinds, The FOX Runner Matrix (and all FOX Matrix® systems) allow label converters to use finer, narrower, less wasteful materials, eliminate cores and even directly interface with on-line recycling systems. Another important feature of the CAC FOX Matrix removal system is that it is a ”dry,ldquo; clean system and does not require the use of lubricating powders or oils that can have a negative impact on adhesives and pressure sensitive labels. It is available with or without a Teflon coating and can be used for both adhesive and non adhesive materials. The Fox Runner Matrix uses CAC's widely employed Fox TrimAway® pneumatic trim removal components mounted to a portable stand for permanent, semi permanent and temporary applications. The complete Fox Runner Matrix portable system includes CAC's exclusive venturi design; a regenerative, exceptionally quiet, virtually maintenance free blower; all the blower hardware, motor starter, plug and cord and blower filter. Additionally, the system includes pick-up nozzle(s), specially designed clamps for easy, permanent or temporary venturi mounting, 10-foot standard discharge duct with high torque duct clamps; complete welded tubular steel system mounting frame and locking casters. Options include collection units such as high-capacity nylon bags and metal collection bins, and discharge ducts over 100 feet long. A typical turnkey installation is fast, often taking no more than fifteen minutes. In addition to the new FOX Runner Matrix® and standard Fox Matrix® CAC also offers FOX TrimAway® and the FOX Runner® systems engineered for efficient trim removal during production or converting of most web materials including, paper, film, foil, board, nonwovens and textiles. CAC offers complete, money-saving solutions to nearly every trim removal problem. Currently celebrating its 32st year of success, Converter Accessory Corporation designs, engineers and manufactures web handling equipment for converters of paper, film, foil, nonwovens and textiles. Engineered solutions include high quality, cost effective equipment from the simplest aluminum core cone to the most sophisticated unwind/rewind system. CAC is represented by knowledgeable sales engineers and provides extensive consultation and post sales support. Web Handling is the science, engineering and equipment necessary to successfully transport a continuous flexible material through various processes without defect. Enhancing Web Handling with proper equipment will ensure materials are processed at their maximum efficiency, allowing the process to generate maximum profits.